In New Zealand, long distance walking or hiking for at least one overnight stay is known as tramping. There is a great network of over 950 huts throughout New Zealand operated by the Department of Conservation (DOC). 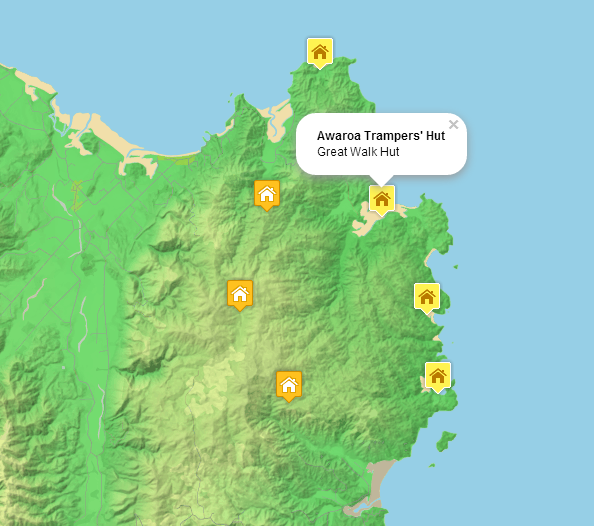 I’ve just stayed in four of the huts while tramping the Abel Tasman Coast Track, and you need a lifetime to reach them all. It’s much quicker to map them. DOC huts in the Abel Tasman National Park. I was fortunate to visit the geospatial unit at the DOC office in Wellington. They have a lot of ineresting conservation projects going on, and it seemed to be a great place to work in New Zealand, especially when you can combine digital work with practical field work. You can download DOC's geospatial data for free on their data portal. Unfortunately, the datasets are not available as shapefiles, so it might require some wizardry to extract the data from KML. Luckily, the Koordinates guys have done this already, and you can download the shapefile from their website. The version I’m using was updated 10 September 2012. The dataset contains 967 huts, and adding them all to my Leaflet map will make it too cluttered to be useful. Instead, I wanted to try the great animated marker clustering plugin, created by Dave Leaver here in New Zealand. I especially like the animated feature of this clustering plugin (try zooming in and out), as it makes it more obvious for the map user what a cluster really is. Whariwharangi Hut, built as a farmhouse in about 1896. Hey.. I was wondering, you use the same variable name for the data if the huts (var hut) and for the marker cluster group, is that an error or is it okay? It was not intentional. I've renamed the first variable to "data". hi, this is a really useful tutorial, thank you for posting it. I've been struggling with a way to cluster or spiderfy the markers on a map I made in which every marker has a unique icon and hover-over display text, and this is the closest I've found to some help.